What is SCORM, Tin Can, xAPI and AICC? 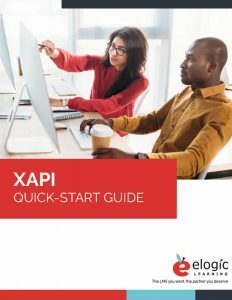 FREE DOWNLOAD: xAPI Quick-Start Guide. Fill out this worksheet to help you get started with xAPI in your training strategy. Remember back in the day when Japanese electronics giants Sony and JVC were battling it out in the video recording market, vying to make their recording formats, Betamax and VHS (respectively), the dominant player in the industry? Many consumers placed their bets on Sony’s Betamax, but VHS ultimately won the day! The same leadership war played out for DVD formats; which ultimately has seen Blu-ray triumph over HD-DVD formats. What Betamax, VHS, HD-DVD and Blu-ray have done for video viewing, so too are technical standards for Learning Management System (LMS) doing for the eLearning industry. Elearning content needs to conform to certain standards in order to interact with LMS solutions. Developers have worked on creating standard protocols that can both integrate widely with various systems and contain the flexibility and features needed to develop and track learning. Sharable Content Object Reference Model (SCORM), was developed by the U.S. Department of Defense (DoD) in 1997. SCORM modules are interoperable, accessible, and reusable between compliant LMSs. They are also the most widely used. The most recent version was released in 2004. Tin Can API, which is also known as the “Experience API” (or xAPI), is positioned as a standard that goes beyond a specific learning environment. Stewarded and pioneered by the US DoDs Advanced Distributed Learning (ADL), it is an API that’s community driven, and is free to implement. It’s been developed more recently than SCORM with mobile devices and other modern technology in mind. So, why are these technical standards important for anyone who is researching LMS solutions? Well, while each of these standards have different features and functionalities tied to them, their ultimate objective is the same: They’ll act as intermediaries to ensure that the eLearning content you develop “plays nice” with your corporate LMS. Some professionals believe SCORM and other protocols affect the way content looks. It doesn’t. It’s important to realize that these protocols are purely about exchanging data. On the user side, the experience remains the same as long as everything is working the way it should. This is all technical stuff. While the best LMS software is so well-designed that SCORM and other standards are not something that you will have to worry about, it’s still important to know about them so that you can ask the right questions when researching your LMS. You want to ensure that you are choosing a system with the most updated versions of these protocols and a vendor who has taken them into careful consideration when building their application. Currently SCORM, which is available in its 2004 edition – its 4th, is the de-facto industry leader in terms of eLearning standards used. It does not address any pedagogical concerns or speak to specific instructional design constraints. It is a technical standard for eLearning software solutions. Any SCORM-compliant LMS system is able to interoperate with any other SCORM-compliant environment, and vice versa. This then gives prospective LMS solution acquirers the incentive to consider SCORM compatibility when evaluating their future LMS tools. You may have noticed that the last version of SCORM was released in 2004. That’s over fourteen years ago. This may make the protocol seem old fashioned- after all, it was last updated before even mobile learning became standard- but it was so well designed they haven’t had to update it. Despite the age of it, it’s still used more widely than more modern protocols like Tin Can/xAPI because it still works just fine, even on mobile, and is almost unanimously implemented. One notorious setback associated with SCORM is its browser security limitations. As a result, SCORM does not enable communications between cross-domain content. So, if you had an LMS system on one domain that needed to share content on another domain – that would be a challenge for SCORM. However, eLearning occurs in a diverse range of environments – not just within a SCORM-compliant setting. By virtue of its ability to record learning experiences in any environment, Tin Can/xAPI may provide more broadly applicable learning solutions. Tin Can is considered more reliable and the features continue to grow as it continues to get developed. It’s not infallible, however. While Tin Can offers a few more features over SCORM it’s crucial to keep in mind that it also lacks the ability to do things like track time spent in a course and it can’t report on launch history without a separate application to read and decipher the statements. It’s also not as widely understood or available. Tin Can’s latest version was released in 2015 and it also had a companion specification released in 2016, which is still very limited in use but is meant to expand the xAPI trackability to more traditional LMS learning environments. In many ways, AICC, which has a history dating back to 1988, started it all. What sparked the need for standardization in the training world was the realization by leading aviation companies, like Airbus, Boeing and McDonnell Douglas, that they needed to move away from “closed” training solutions. They formed AICC, which initially outlined its standards for CD-Rom-based CBT, but by 1999 evolved into a web-based training environment (HTTP-based). Eventually the standard influenced online training for all industries. While still considered a pioneer of online training standards, AICC was disbanded in 2014, and all of its assets and capabilities transferred to the DoDs Advanced Distributed Learning (ADL) group. This doesn’t mean it can’t still be used, however. Many organizations still use and support it today. It will likely continue to fall out of use but it’s still important to know that it exists. Just as humans rely on some form of common language- be it signs, icons, emoticons, symbols or interpreters- to communicate across boundaries, borders and cultures, so too do LMSs need certain standards to communicate with each other and with the content they manage and disseminate. Without these standards, LMS users would have a tough time understanding if specific content could be hosted or “launched” through their corporate learning environments. Which of these standards should you consider when looking for your corporate LMS solution? Well, it depends! Some organizations look for product maturity. With its 1st edition released in 2001, SCORM has been around the longest of these standards and grown with the LMS industry. SCORM is the most widely used, and therefore, almost every LMS is capable of handling SCORM. Most third-party content is created using SCORM protocols, so an LMS without SCORM would be at a sore disadvantage. xAPI expands the learning environment, and adds more options to administrators who wish to track data. If SCORM is the standard, then xAPI is the luxury add-on. xAPI had its specifications, Tin Can API 1.0, released as recently as 2013. Rather than just course-based information, some companies may wish to collect data about their learners from a broad range of learning experiences. It is the relatively new kid on the block, and therefore still in its infancy. However, it can do more than just interact with LMSs. It can also transmit and share data on physical actions a learner might take during course interaction – like pressing a button on a smart phone. Choosing an LMS system requires more than just decisions regarding what content can be played or hosted by the tools. Things like interactivity, scalability, security, global applicability/acceptance, richness of the eco system, must also be weighed. Ultimately, the type of content you’ll be using, the type of audience who will be consuming that content and the way content is to be consumed (desktops vs. mobile devices) will determine which eLearning standard would work best for your needs. We should also mention learning environment here. Ask yourself whether you want training to be done in a designated learning environment (only within an LMS) in which case SCORM is perfect, or if you want to allow for learning to be done outside of an LMS via xAPI and LRSs and capture that data within your learning application. Just some things to consider! This guide includes an xAPI compliance check, specific ideas on how to start implementing xAPI in your strategy, and more!